True to the author who they are named after, the Hemingway line of cigars by Arturo Fuente are bold and unique. 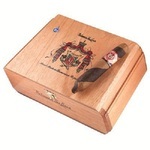 The tobaccos are specially selected from only the finest crops and the rollers are only the most experienced. This cigar has the most unusual shape being tapered at both ends and the Cameroon wrapper ensures a sweet and spicy flavor. Each batch are layed to rest for a good six months before they are released."